Two major brands in the lawn mower industry are Troy-Bilt and Craftsman. Each manufacturer designs a range of walk-behind and riding lawn mowers. Comparisons between comparable mid-range walk-behind and mid-range riding lawn mowers give you an unbiased look at how each companies' mowers compare to each other. The Horse is a a Troy-Bilt riding mower. It uses a 22 hp Kohler Courage engine to power it. The Horse features a hydrostatic transmission. The cutting deck width is 46 inches across and can discharge clippings from either side. Two deck wheels are used to prevent deck damage and lawn scraping. The front axle is cast iron for durability and support. The fuel tank holds two gallons. 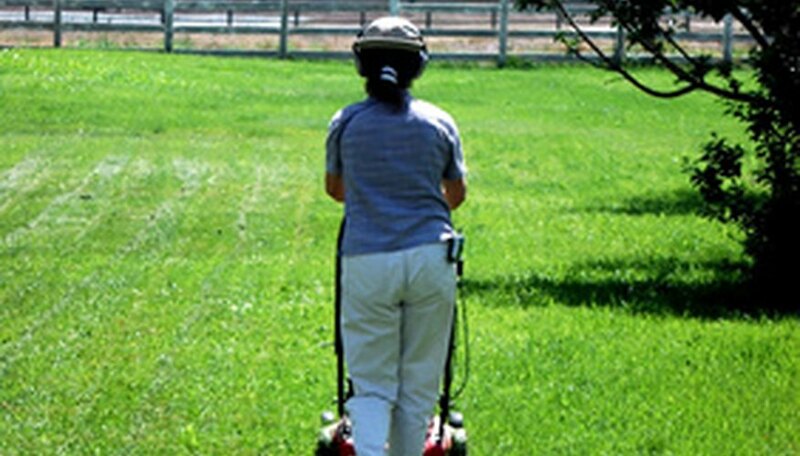 The reverse mowing feature allows you to cut grass while going backwards. The suggested retail price for this mower is $1,499 as of January 2011. Todd Young has been writing professionally since 2010, with travel-oriented pieces and other works appearing on various websites. He attended the University of Kentucky and earned a Bachelor of Arts in political science and a Bachelor of Arts in history.